The television series Angel was brought to a rather abrupt conclusion at the end of its fifth season. The WBC cancelled the show and told Joss Whedon of the decision some time around the making of the sixteenth episode. This meant that he could at least decide how it would end. Yet unlike its parent show Buffy the Vampire Slayer the year before, this ending was far more open, and more indeterminate. Angel had brought forth all manner of hell by killing all the members of the Black Thorn, a secret society that grease the wheels of the Apocalypse. The authors of the Apocalypse, the multi-dimensional Wolfram & Hart, strike back and the last shot is of Angel raising his sword and saying “let’s get to work”. That anyone on his team could survive looked doubtful. It was like Blake’s 7 all over again. Following on from the success of comic book series Buffy the Vampire Slayer Season Eight, Angel: After the Fall is Season Six. It tells the story of what happens after LA had been sent to hell by someone who had sworn to protect it. Volume Three collects editions #8 to #12 of the series. The problem with After the Fall is that it only really found its way at the time of #8. The backdrop is this: with the city gone to hell, Wesley, who was killed in the last episode of the television series, is returned as a ghost. He is still bound by his contract to Wolfram & Hart and is their new representative on this plain. He assists Angel in dealing with the aftermath, although Angel is a vampire no longer and has been returned to human form by Wolfram & Hart. He maintains the illusion that he is still a vampire, and therefore powerful enough to continue the fight, with a mystical glamour. The great thing about a comic book series is that contracts and scheduling do not mess with the writer’s vision. Remember when Angel almost turned into Xena at the end of Season Two? This was a quick-fix that resulted from a scheduling mishap that meant two actors were unavailable. And so the old team bands together: Connor, Gwen, Nina. There is also a psychic fish called George, who had appeared in an earlier comic book of Angel. This is just a little too fey, really. Plus Gunn is now a vampire. What else could have happened to him in that alley at the end of Season Five aside from death? Like the end of Season Two, however, Angel: After the Fall quickly descends into Nerd Territory. Much macho posturing occurs in the turf wars of an LA overrun with demons. Scantily clad women abound. It is all shiny surface and no character, no substance. What else? Spike commands a harem of babes. Illyria postures. Lorne has once again carved out a small corner of LA as his own little bit of Fabulous. (There is some relief in that.) The Groosalug is back. (That lack of scheduling had clearly gone straight to the writers’ heads.) All is thrown into further confusion after Illyria sees the ghost of Wesley after another showdown fight with the various Demon Lords. At this rather confusing point the series takes a break from the main plot, such as it is, to tell the back-stories of the main characters on what happened on the night that LA was sent to hell. It all seemed rather hopeless and so deep into Nerd territory as to leave most readers behind. 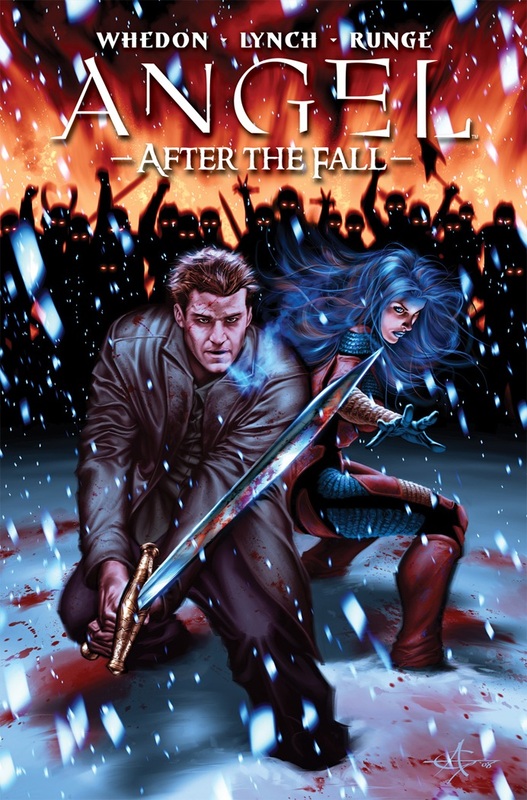 With #8, the first in this collection, Angel: After the Fall finally starts to make sense and to return to the traditional pairing of character and plot. The first thing to note is that the illustrator Franco Urru is no longer on board. There was, it must be said, something rather off with the artwork of earlier editions. Much of it looked like a sheet of plastic had been melted over it. It is now pencilled by Nick Runge and inked by Runge and Shayne Corbett. The result is grittier, and more classic comic book. The plot moves away from the Demon Lord posturing and toward a conflict with Gunn that is driven more by character and is rooted in the history of the television series. Gunn is now the carrier of the visions, and he needs Angel’s help. This takes the story right back to the beginning, to the very why and what of Angel. And the rest is … spoiler. There is so much in the way of plot that it would be an injustice to lay it out. Yet it must be said that when a major character does return in #12 it makes complete sense and is utterly satisfying. At the time of writing, the eighteenth edition of the series has just been published. Angel: After the Fall continues to get more complex and interesting. It is proof that the faulty start was not the herald of what was to come. If it were on Fox TV it would have been cancelled before it could get going. Just think of the early episodes as back-story to a tale that grows in stature with each issue.